A glorious autumn day for the last round of the season at Kew. We were very happy to welcome Steffi Vogel back from her fourth placing at the NT Amateur in Alice Springs and Alison McCaig from her week on the sidelines resting her back. We were up against Spring Valley who were very keen to avoid relegation – we knew it would be close. We also got our hands on a rainbow collection of PK hats, which most of the players wore to celebrate the last round (thanks Liz for the attached photo). We ended up going down four matches to three, but it could have gone either way. First home was Birgit Yandle, with a strong 4&3 win, giving her four wins for the season. She was closely followed by Steffi Vogel, with an excellent 6&5 win. Sophie Crouch ended up facing Spring Valley’s top ranked player at number 3 and couldn’t stay with her, going down 5&4. Alison McCaig struggled after her week off, going down 4&3. Sonia Hartley, helping us out again from the Friday team was up at the turn, but faded a little on the back nine to go down 3&1. Johanna Wyllie continued her good form from the Younger Members’ Masters and posted a 3&2 win. That left Lorinda Hartley as the last player out on the course for the third week in a row. The match had been up and down all day, but her opponent played very steady golf on the back nine to post a 2&1 win. We finished fourth on the ladder with three wins and four losses, well ahead of Woodlands on percentage, so retain our place in Division 2. The final will be between Victoria and Metropolitan on Sunday April 28. Thanks to all the players, caddies and supporters throughout the season. It has been a pleasure to be Team Manager for you all. Looking forward to seeing everyone at the Pennant Dinner on Friday 3 May. Details will be sent out in the next few days. This week we knew we were in for a fight, and we got it! Metro has a very strong team, and in spite of some really close results we just couldn’t quite make it over the line. Once again the autumn weather was mild and perfect for golf. The standard of play this week was excellent, with the greens at Kew making everyone think twice about line and length. 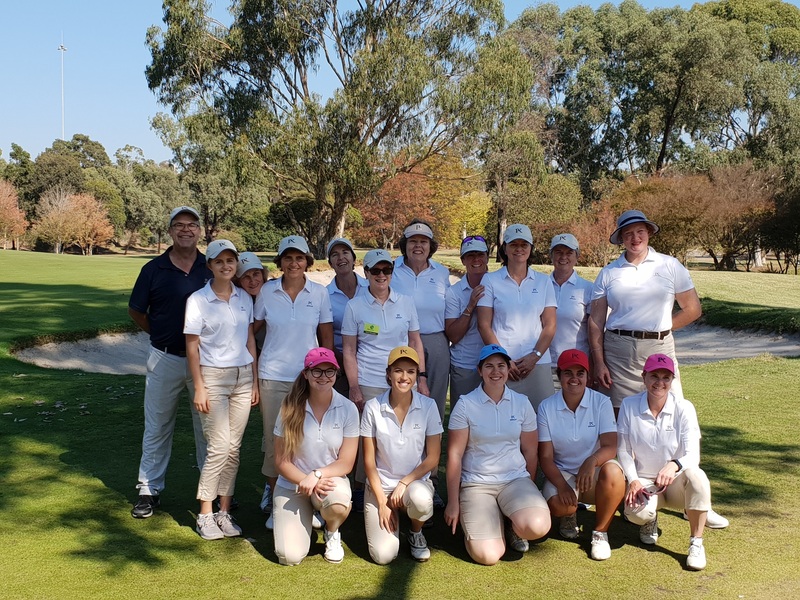 The close finish of several of matches showed that we were very competitive all day, but ultimately their much lower average handicap range was the difference. Heidi and Robyn came home to great applause for their gritty wins. Congratulations to all players, caddies and support team. Great comradery is a key to success, and the bond shown between all members contributed to a very enjoyable and competitive season. Our position in Div 2 is consolidated for 2020.